Zebra QL 420 Plus - Direct thermal, 4 inch print width, 8MB RAM, 4MB Flash, LCD, 802.11b Symbol Worldwide, Shoulder strap. Power supply (Part# CC16614-G4) not included. See accessories. From warehouse floors to parking lots, there are no printers more durable than the QL series from Zebra. 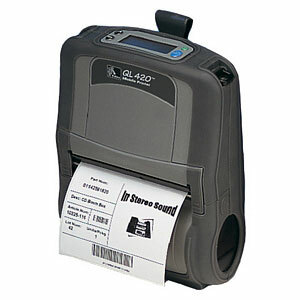 The updated QL 420 Plus direct thermal mobile printer has been designed with the most advanced technology in rubberized over-molding to maintain both rugged construction and minimal weight. With center-loading media, smart battery monitoring and an optional LCD, it provides user-friendly options to keep your business moving. All units ship with one user's manual. Maximum Label Roll Diameter: 2.625"
The Zebra Q4C-LUNA0010-00 is also known as ZEB-Q4C-LUNA0010-00	or Q4CLUNA001000	.